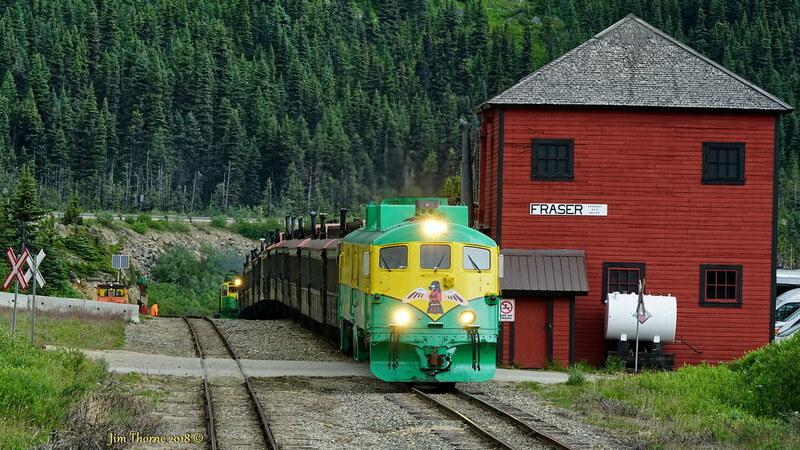 Here's a photo taken on Monday afternoon, July 7, at Fraser, BC. 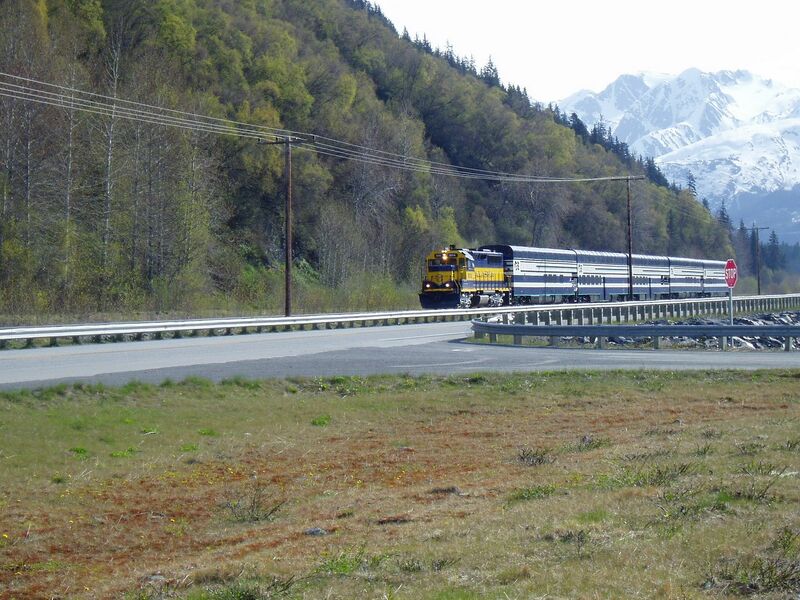 Twenty minutes later we saw another long passenger train heading down the 4+% grade to tide water in Alaska. Cool photo! 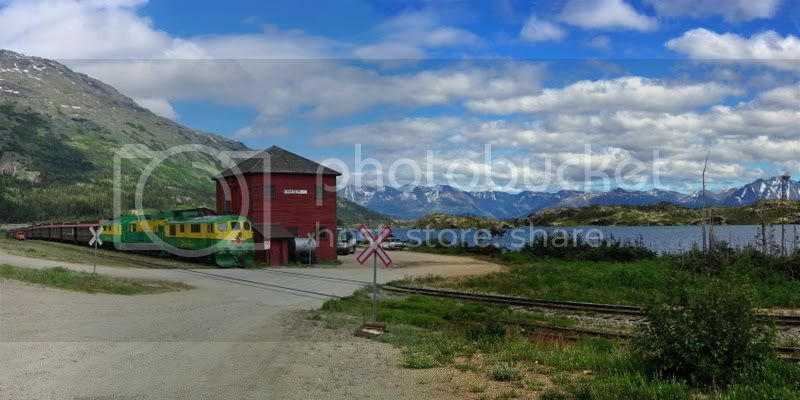 I have never seen anything like it, between the scenery, locomotive and little red station it makes for a unique shot. 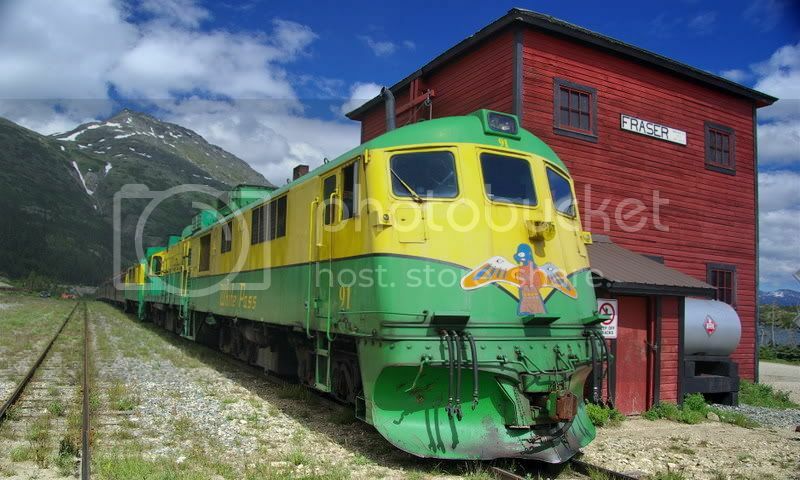 What kind of locomotive is that and is it narrow gauge? 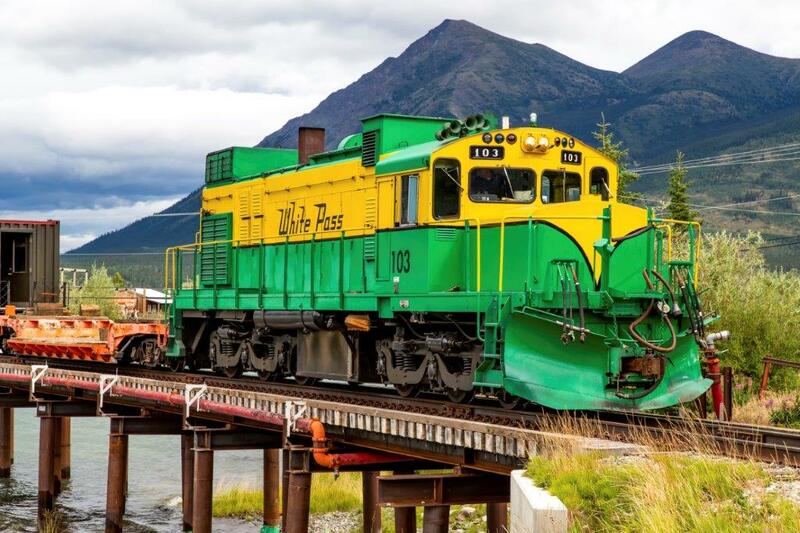 Yes, this is narrow gauge - White Pass & Yukon Route... The locies are quite unique. I have seen nothing like them elsewhere. 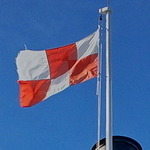 However, the 2nd locie is of a more conventional design. 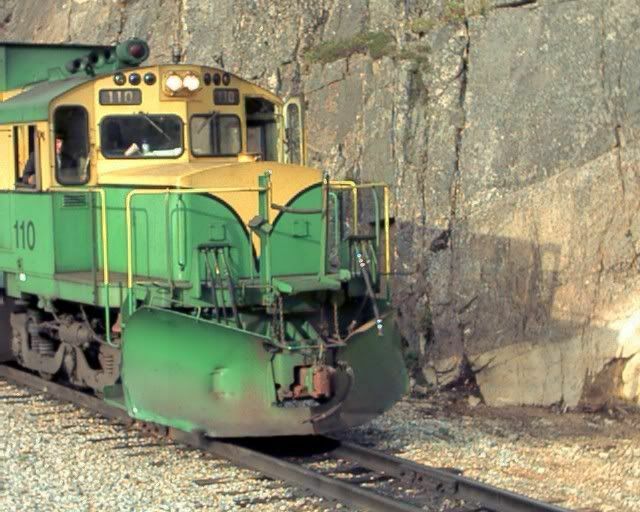 Okay I did a search and the first locomotive is a GEX 3341 and the second one is an Alco DL 535. 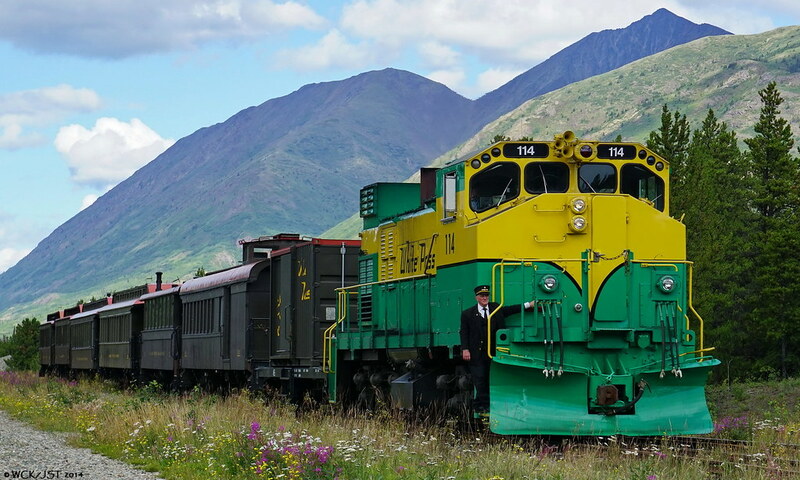 First one looks one of those European Locomotives that pull passengers and some freight through the mountain regions of Europe. You see them in various European countries on some of the non-high speed trains. 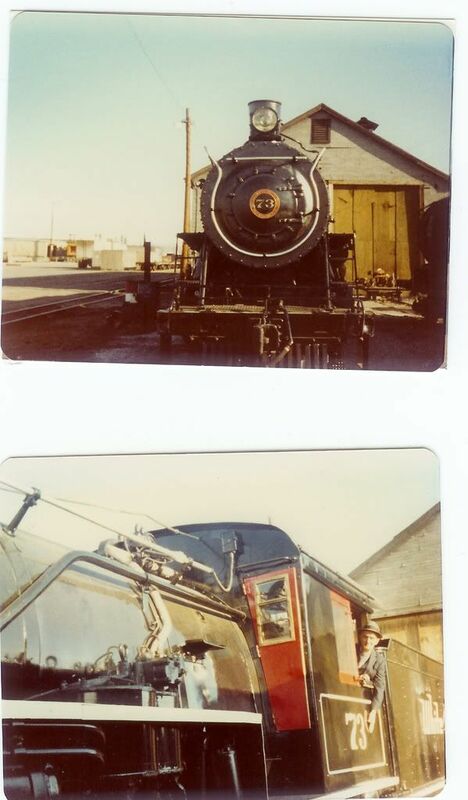 My post last night was wrong for the first locomotive and half wrong for the second one. Looking in the trackside guide it lists #91 as a GE 84-ton built in June, 1954. The second one is an MLW RSD-35 built in either 1969 or 1971. 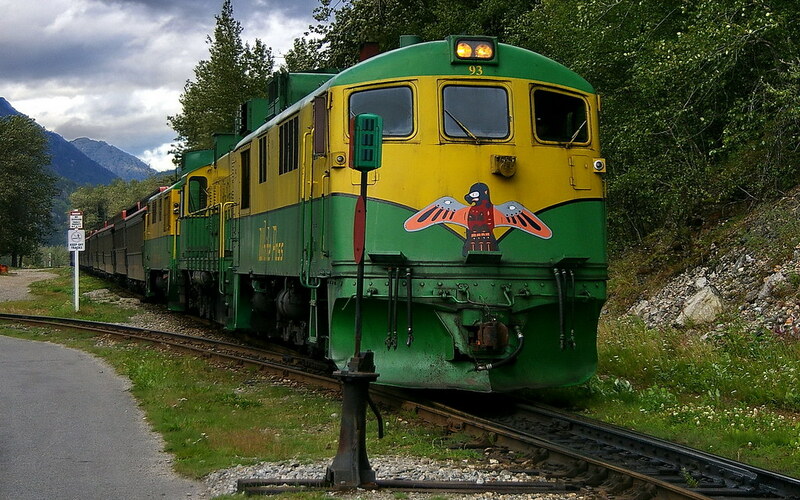 Also, if was number 101, 103, 104, 106, or 107 it spent 7 years in Colombia from 1992 until 1999 when White Pass and Yukon reacquired them. There is no listing of horsepower unfortunately. 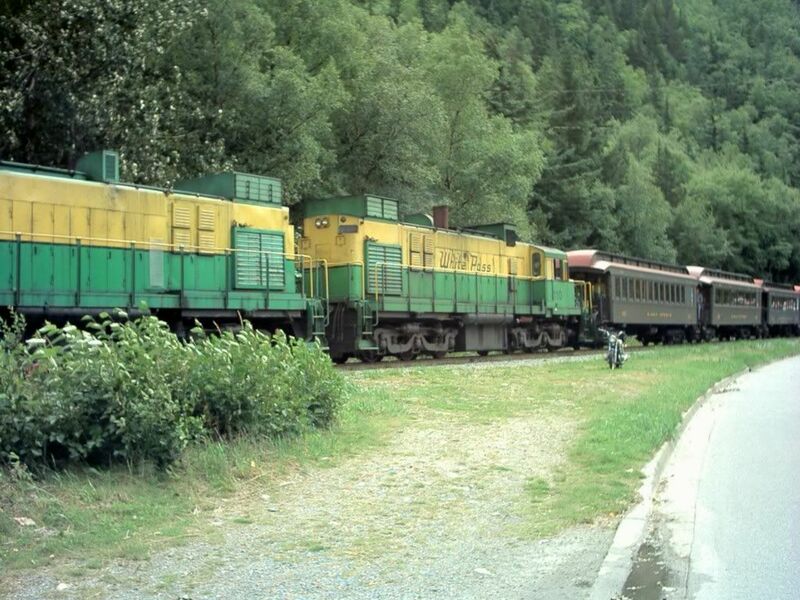 The second train we saw had (what appeared to be) an identical 3 unit combo on the head end. 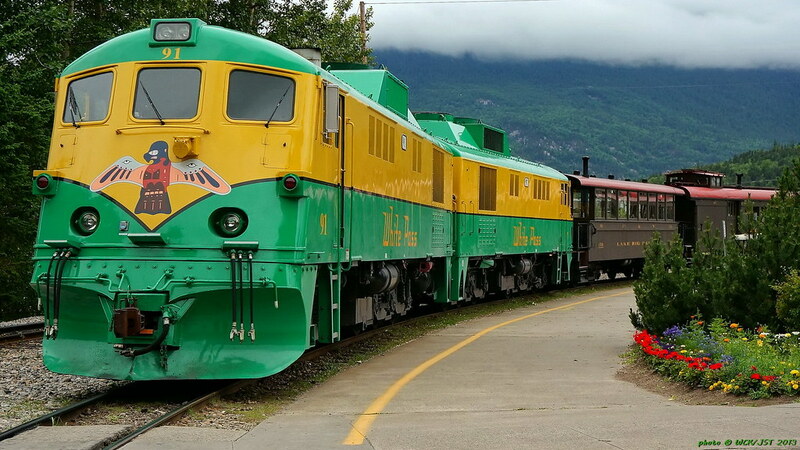 I assume these engines are fitted with dynamic braking for the 4.5% downhill grade to Skagway. 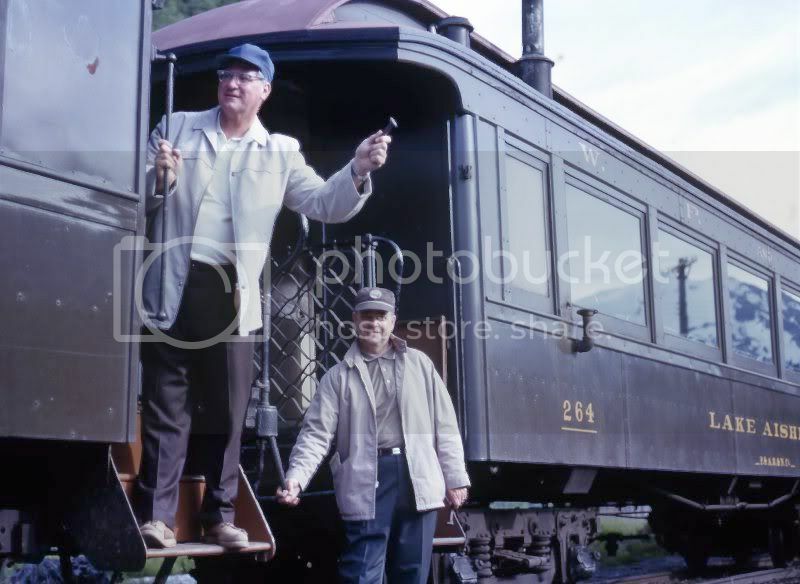 All Aboard from Skagway, Alaska July 1966! 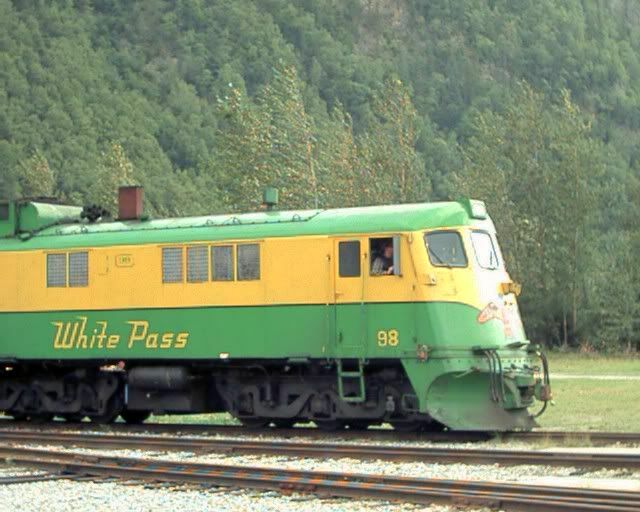 Has anybody on this here forum taken the White Pass and Yukon Railway (WPYR) passenger train trips before? I was checking out their website and it looks like an interesting thing to do. 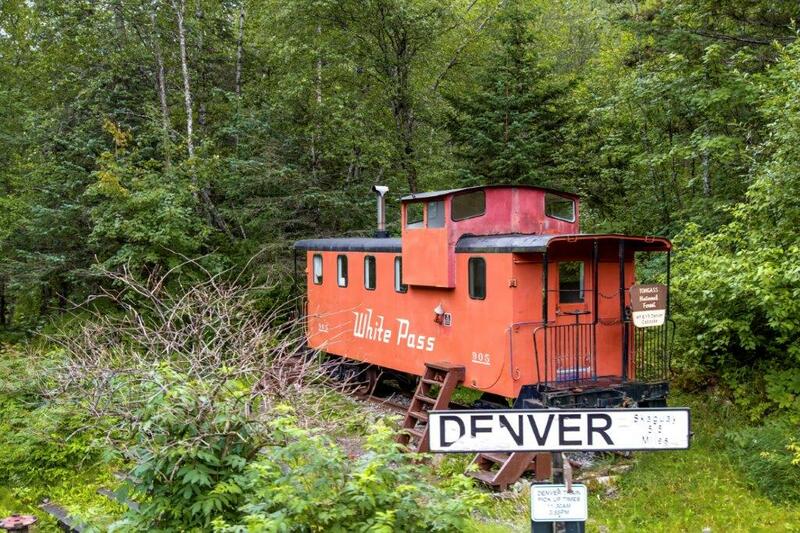 I have hundreds of White Pass pictures. 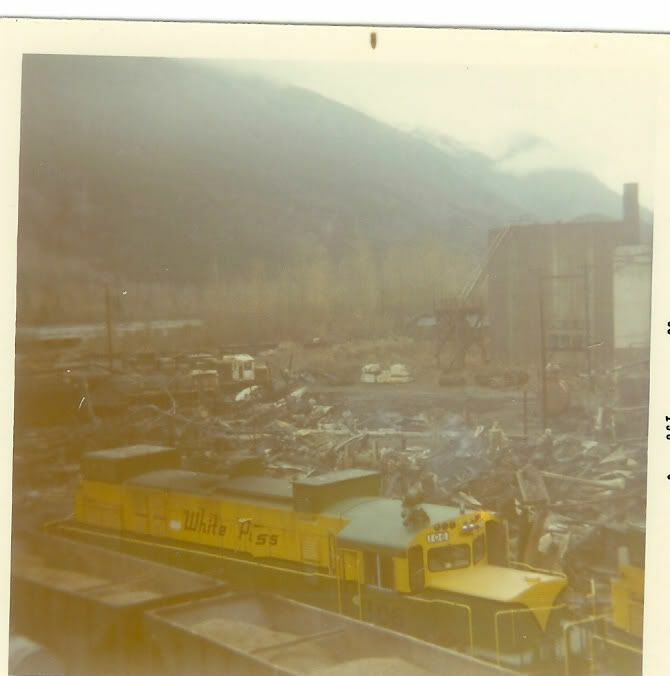 I grew up in Skagway. 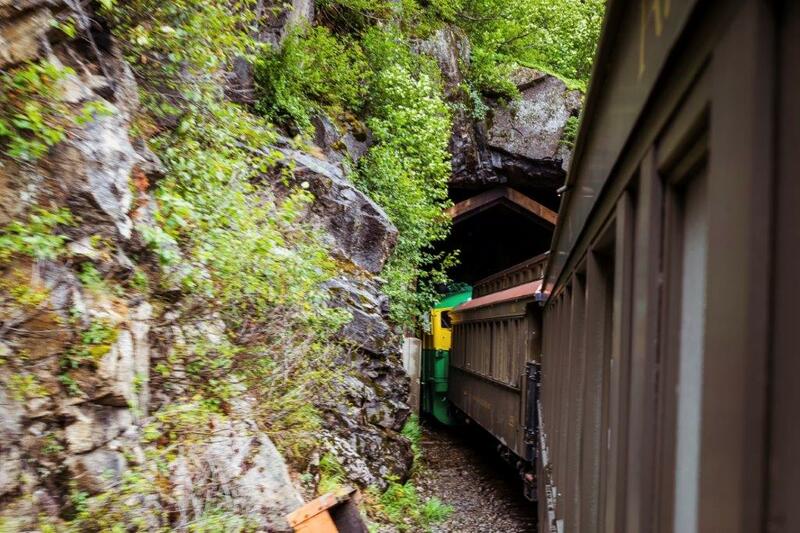 What would you like to know about that railroad? 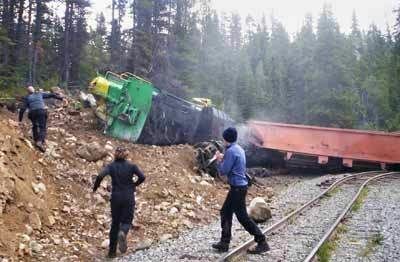 I have pics of bridges, trains, crashed trains, people - all sorts of things. There's another site that you might be interested in also. 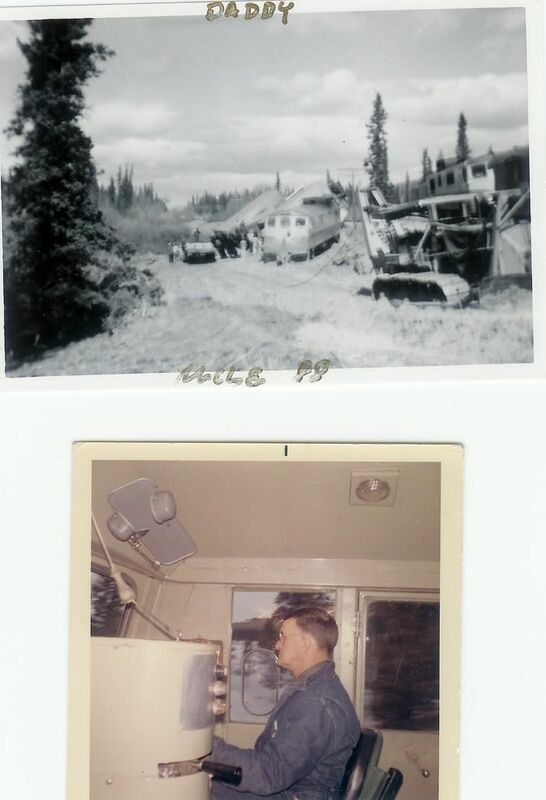 Some old and recent White Pass photos . . . 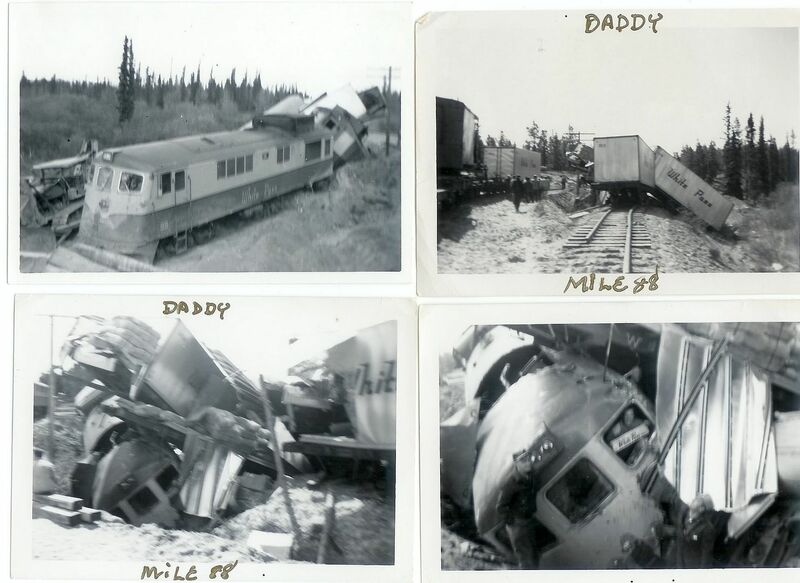 Wreck recovery at 88 miles and Gramps driving the 90, he caused the wreck. 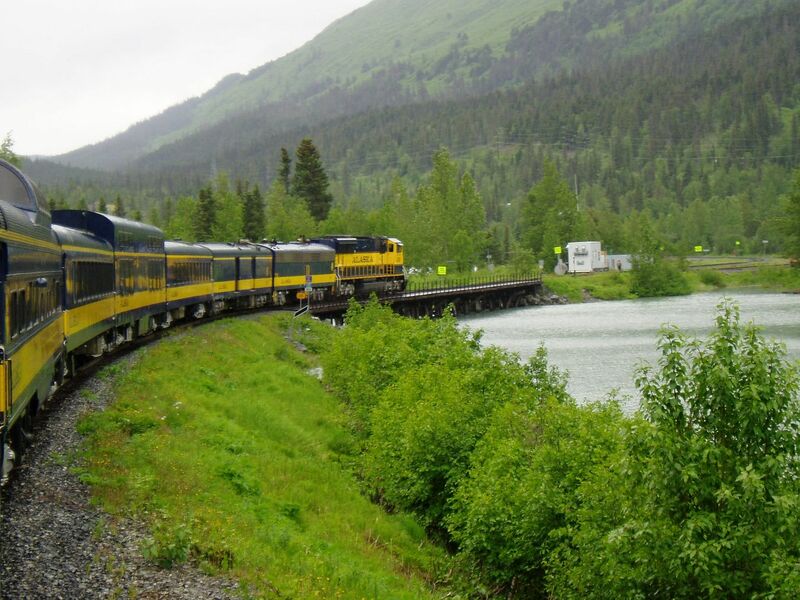 And some Alaska RR Photos . . .
- well, that was a bit of work to fix the oversize photos, but now I know how to do the easy fix. - for the poster, please ensure that your photos are not > 1,024 wide, and please double-check after you post. - and please don't run away because of our photo size rules. Your photos are appreciated ! but remember the 1,024px max. 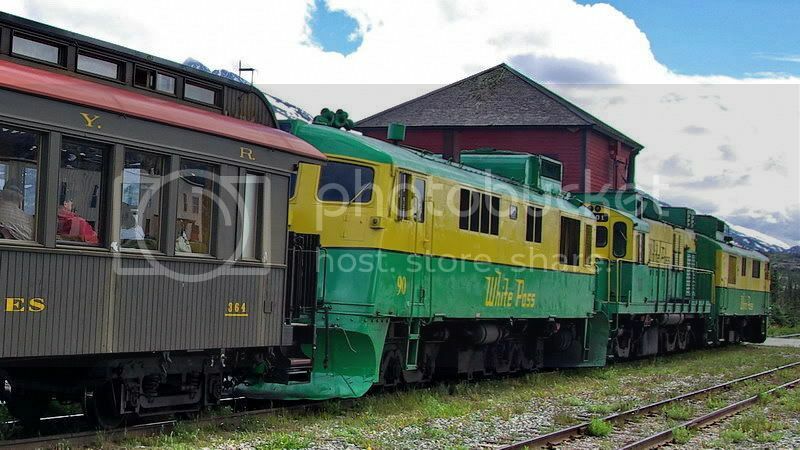 Here's a thread for all kinds of items related to this WP&YR railway. 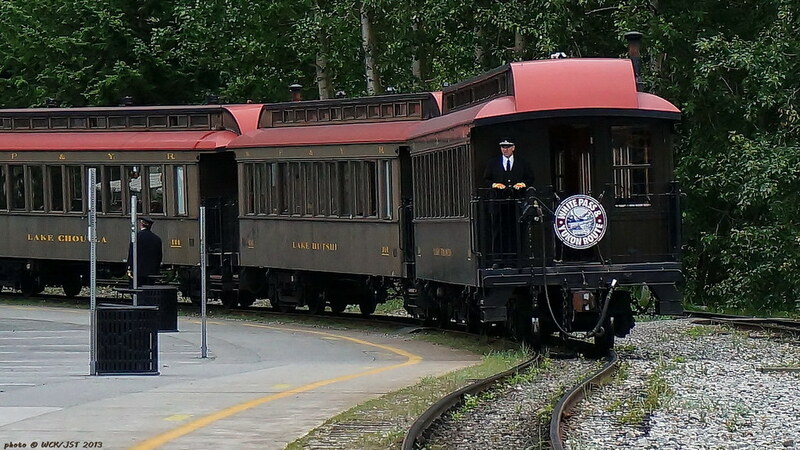 On 6 July 2013 I, along with my wife & guests from the UK, did a WP&YR excursion from Skagway, Alaska, to Carcross, Yukon. 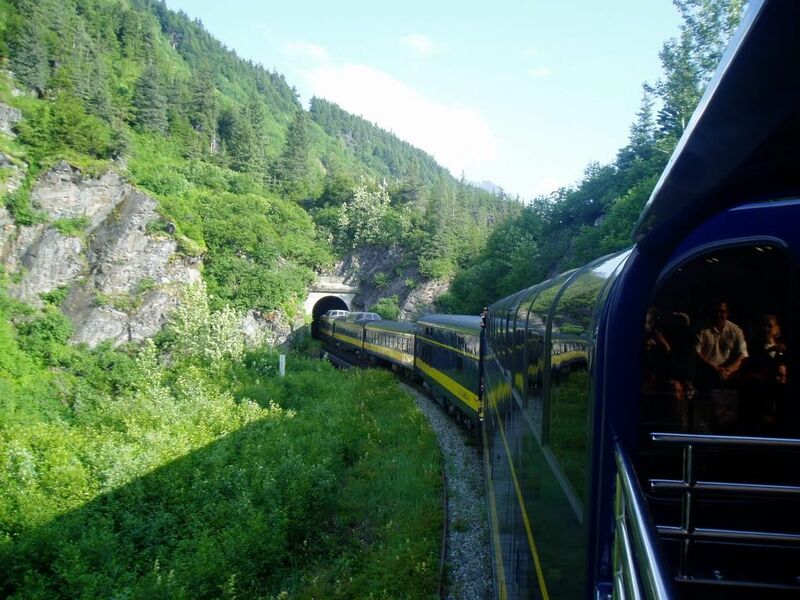 (This was during our Alaska cruise aboard the HAL liner MS Volendam.) 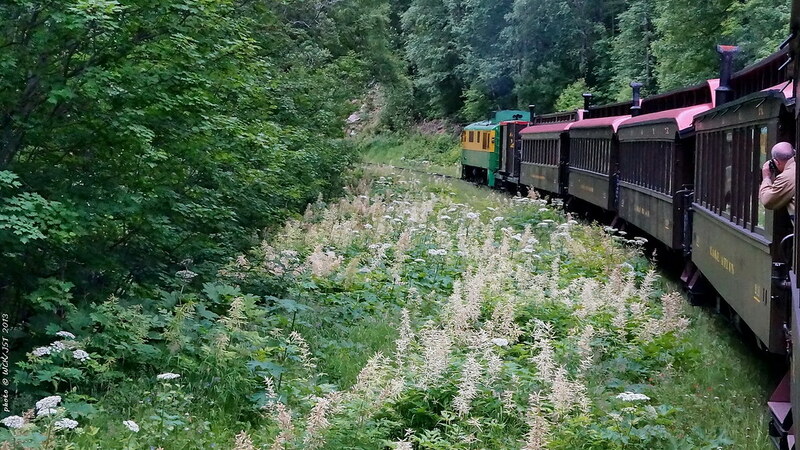 A few photos from this narrow gauge rail excursion are presented below. 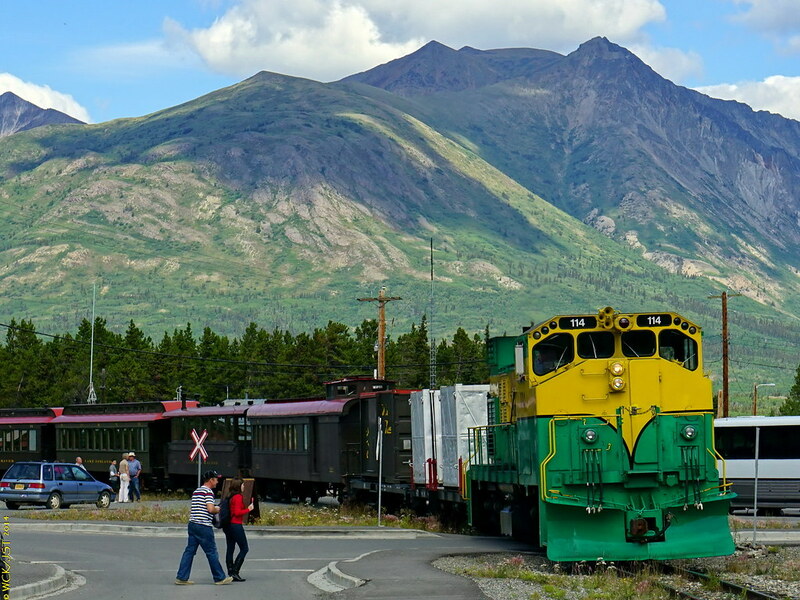 The trip starts in Skagway, on Alaska's Lynn Canal, goes steeply uphill (4% grade) over White Pass and into Canada & a sliver of BC before going into the Yukon & finishing at the small and attractive village of Carcross. 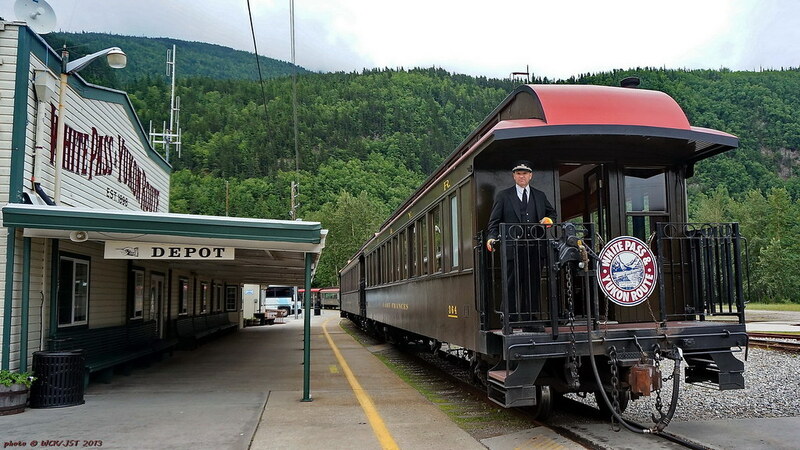 The trip included an old-fashioned dining-station lunch at Bennett, BC. The excursion that we went on is not one that is pushed by the cruise lines. 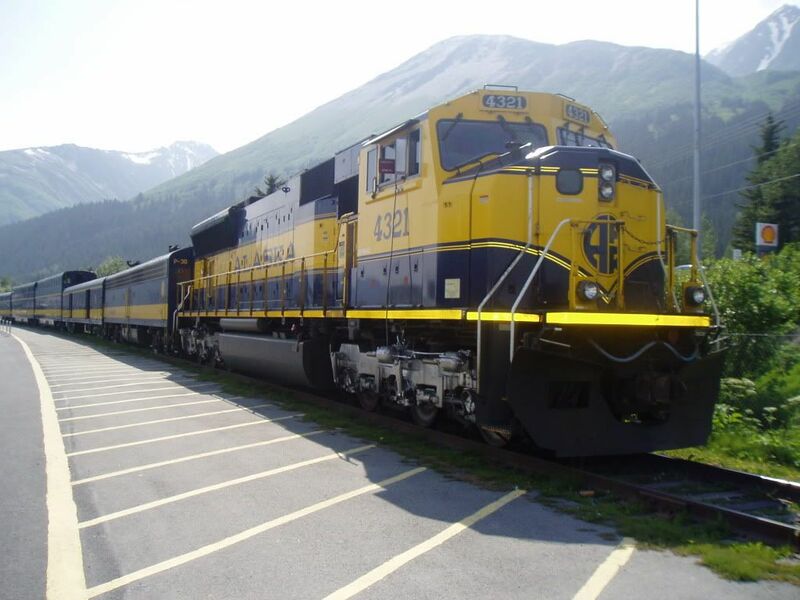 Those trips take passengers only as far as White Pass, or Fraser, BC. 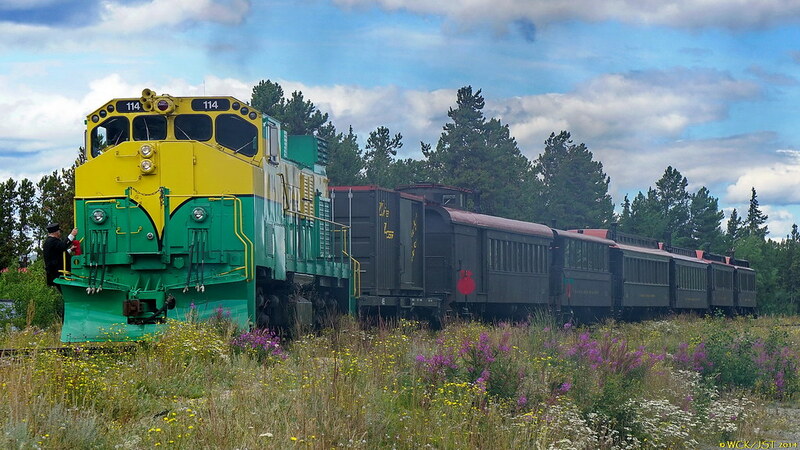 The trip we did includes all of the WP&YR line that remains in operation. 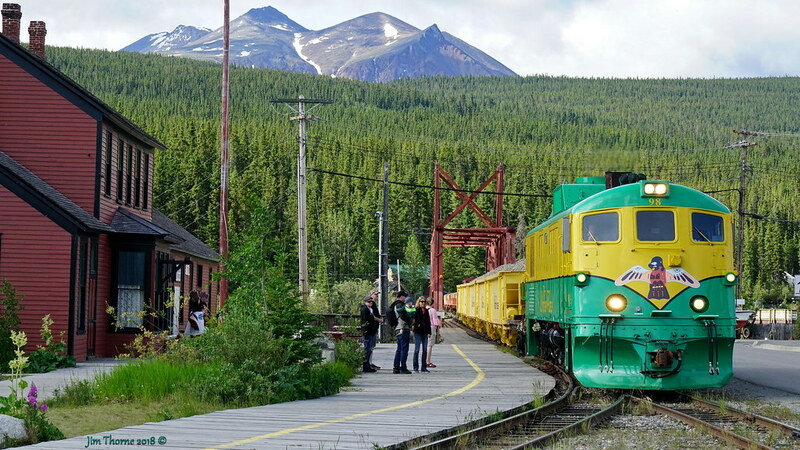 (The line from Carcross to Whitehorse, Yukon has not been operated since the early 1980's.) 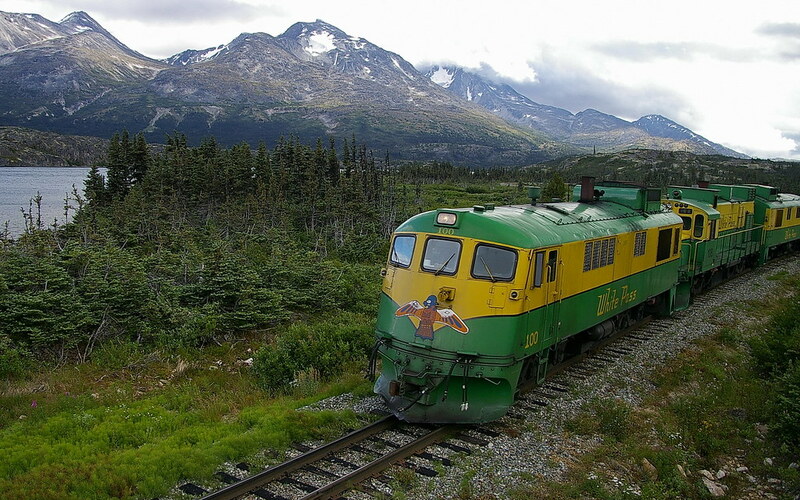 This train also includes a 'hikers service' picking up & dropping off backpackers starting or completing the famous Chilkoot Trail. 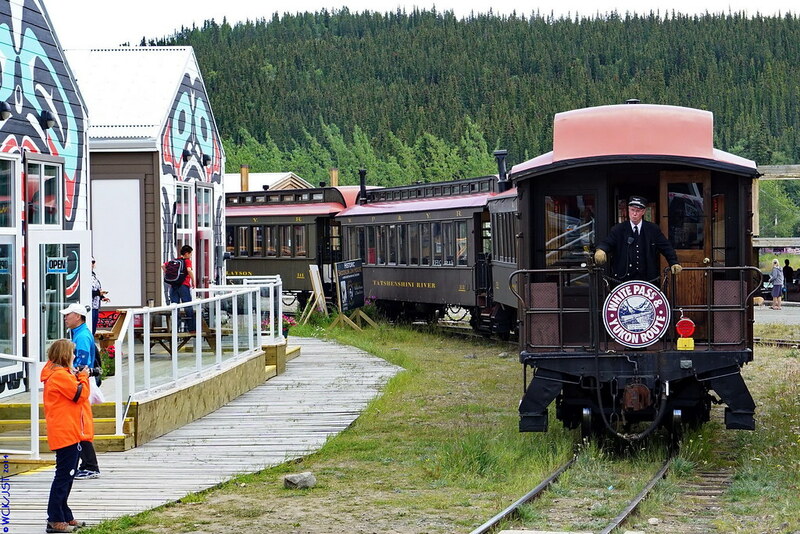 Our return from Carcross to Skagway was aboard a small tour bus & included some interesting stops as well. 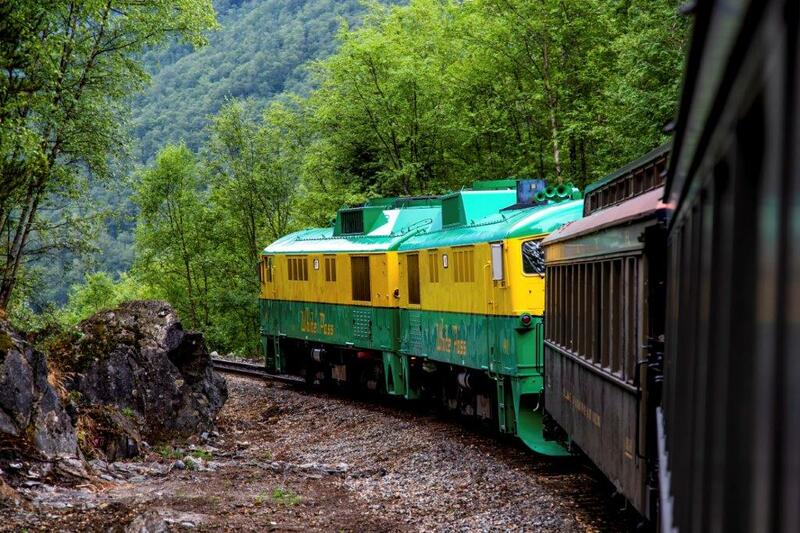 In the summer of 2013 this excursion operated three days per week during the tourist season. 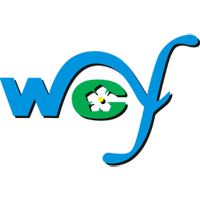 Check the WP&YR website for info on this excursion in summers to come. Although a little pricey, I would highly recommend this trip to others. 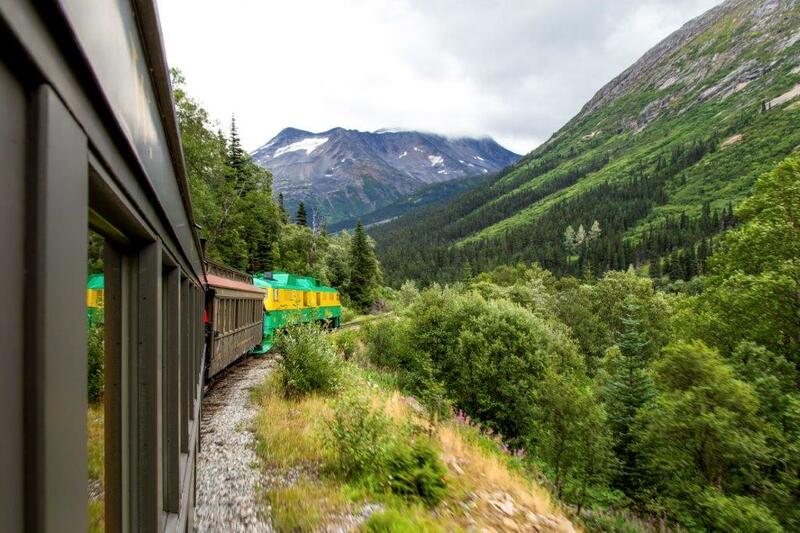 It ought to be on your 'bucket list'. 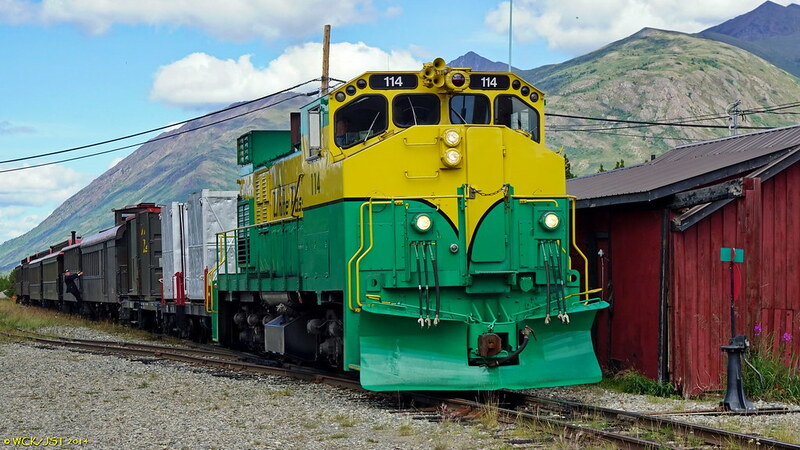 Head end of WP&YR train @ Skagway depot, Alaska - 6 July 2013. 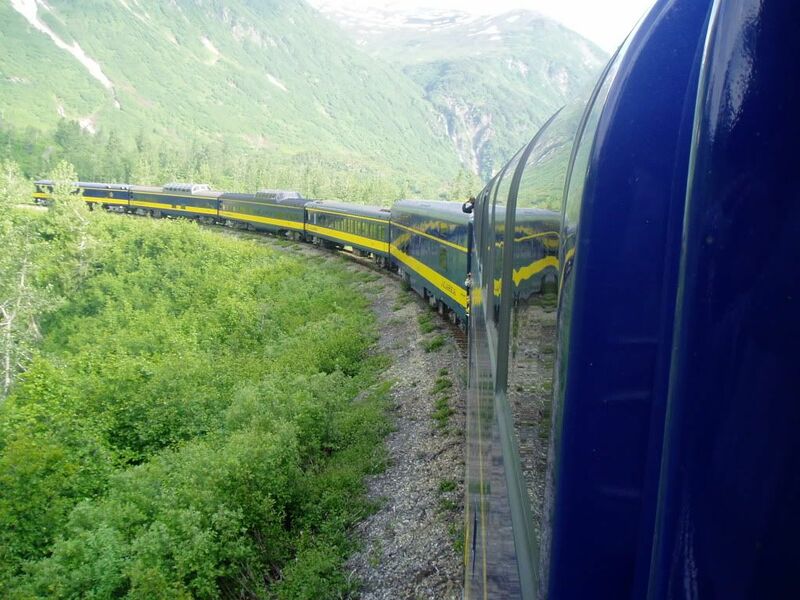 This was not our train; it was a cruise ship summit & back train. Tail end of White Pass & Yukon Route train with conductor ready to board passengers in front of depot @ Skagway, Alaska - 6 July 2013. 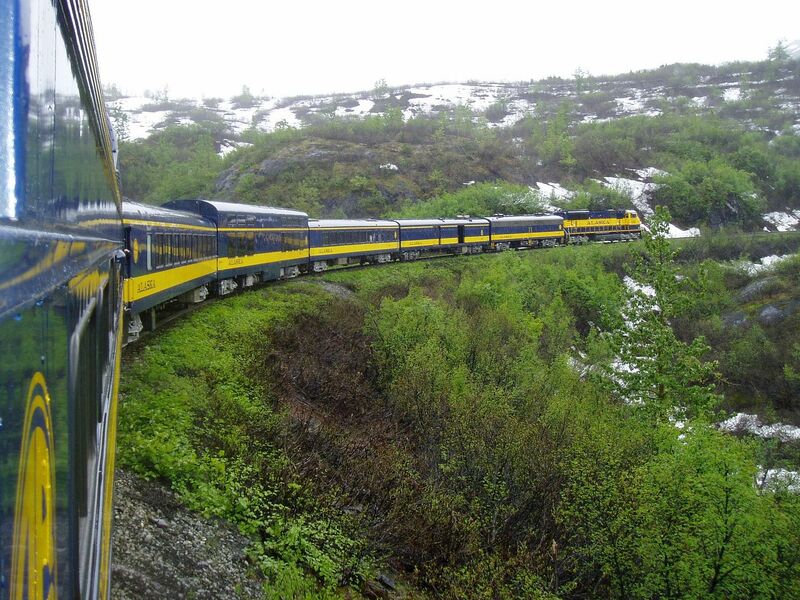 This was not our train; it was a cruise ship summit & back train. 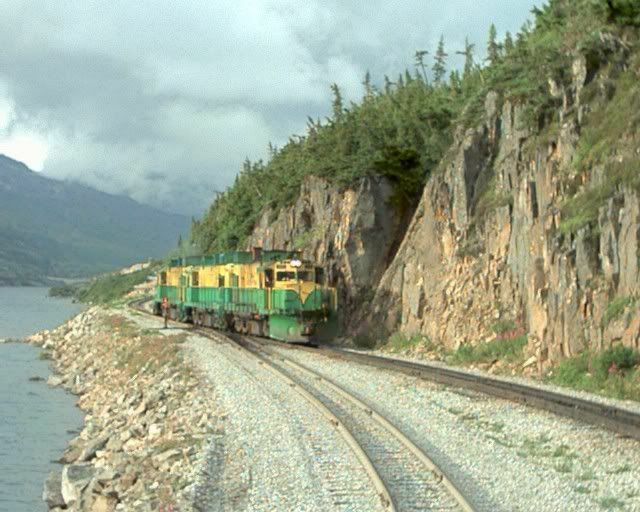 This view clearly shows that the rail gauge is narrow; 3 feet to be precise (versus standard gauge 4 feet, 8 & 1/2 inches). 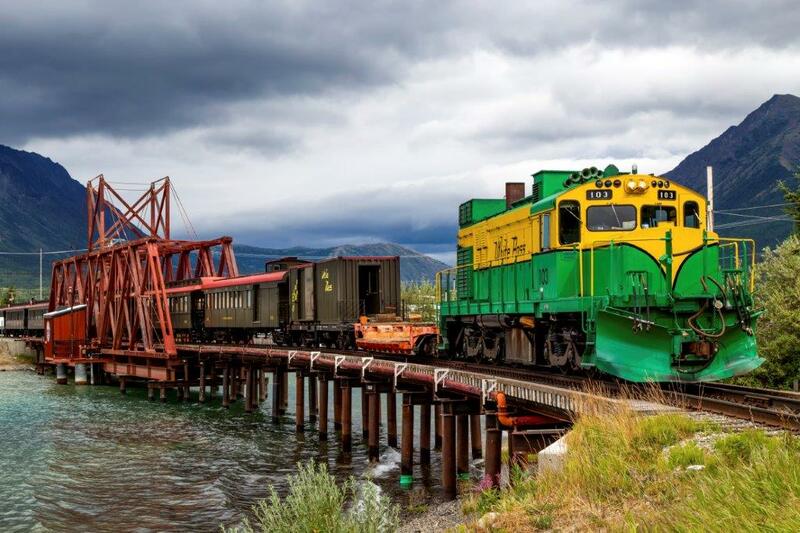 White Pass & Yukon Route maintenance-of-way train passing in front of the Carcross, Yukon depot - 6 July 2013. 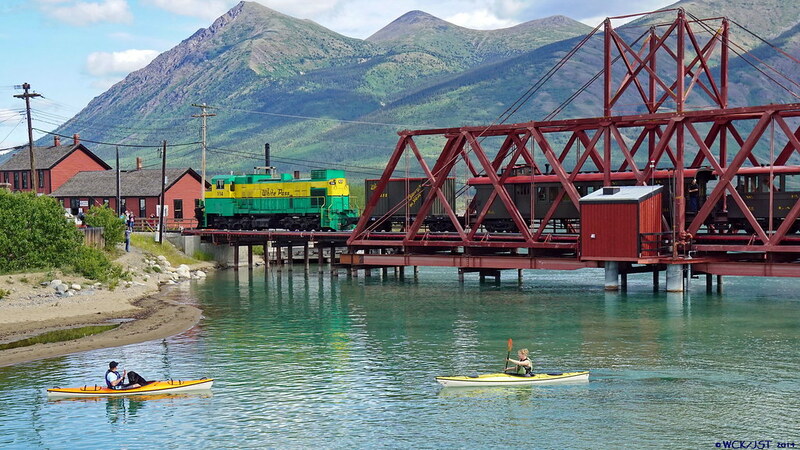 We spent a day down at Carcross, Yukon, the site of Yukon's only desert. 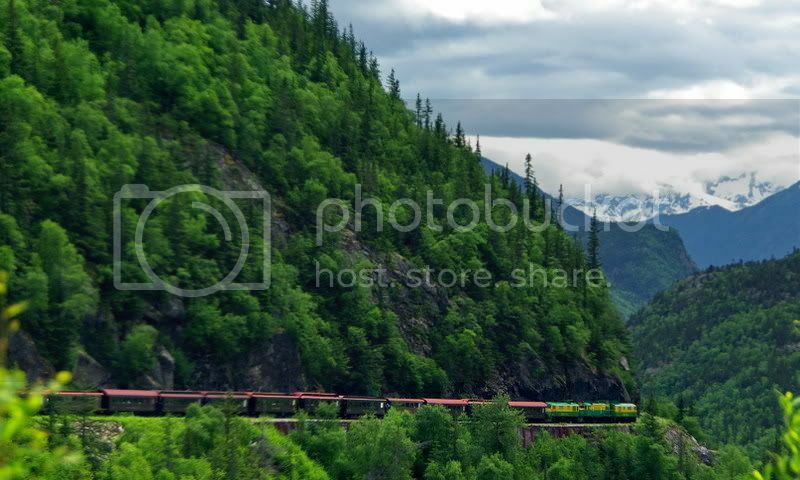 I was lucky enough to again see a WP&YR passenger excursion train arriving from Skagway, Alaska. 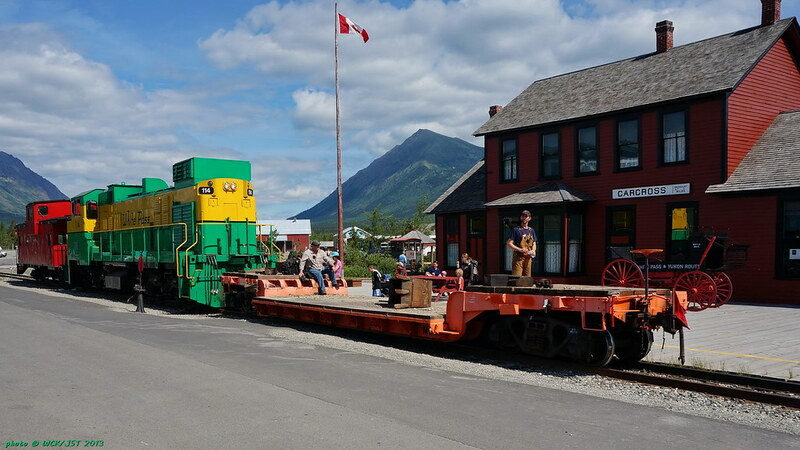 Moving across a busy street in Carcross, Yukon, getting the train ready for the return trip to Skagway the following day. 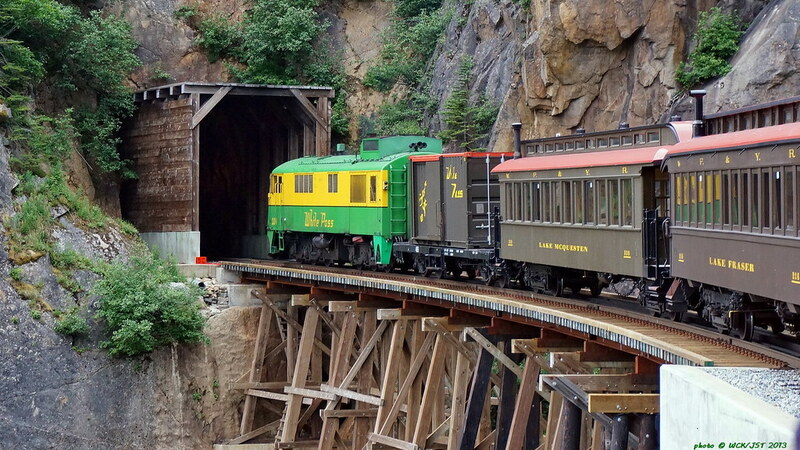 My Father recently took the White Pass and Yukon steam excursion. 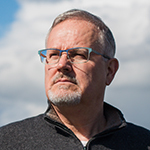 His pictures may be of interest to people in this group. White Pass and Yukon Route, STEAM! ...now I have some fun scrolling, gazing and reading to do on those 3 pages. Good stuff. Photos from my afternoon riding the White Pass and Yukon! You certainly had better weather than I did, but thoroughly enjoyed the trip! Bussed it to Carcross and back to Fraser. 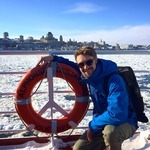 In fact, I would like to do my cruise again in better weather, especially for the train. We had limited time for vacation this year. 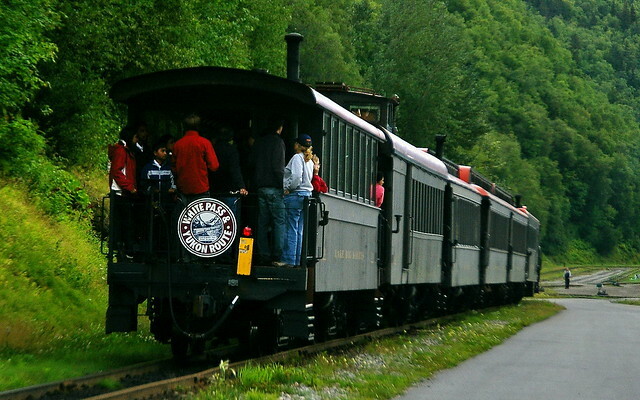 I spent a summer working in Skagway in 2010 and was there from May 1st until September 25th. 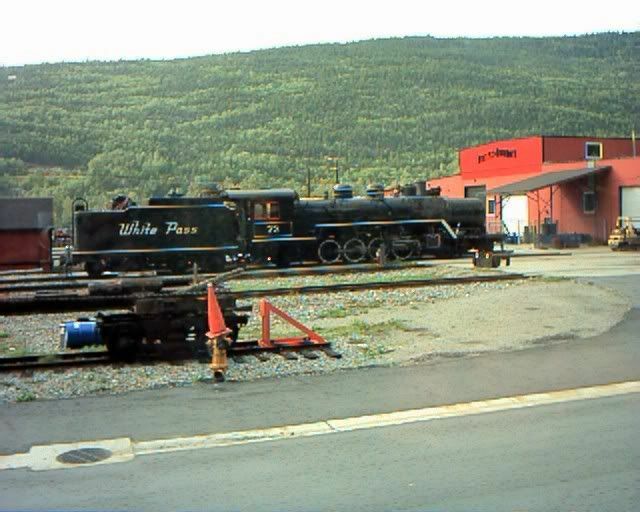 I frequently made trips to Whitehorse, both for work, and personal (if you really needed groceries...) as well frequent travel between Skagway and Carcross for work (in the company car). One of the indelible memories of that summer was watching the seasons and the changing landscape. At the start of May, everything beyond the top of the pass is still covered in snow. Soon that melts, the plants bloom, and by the time September 1st comes around, fall is in the air. If you go at a slightly different part of the season, the landscape will look completely different. 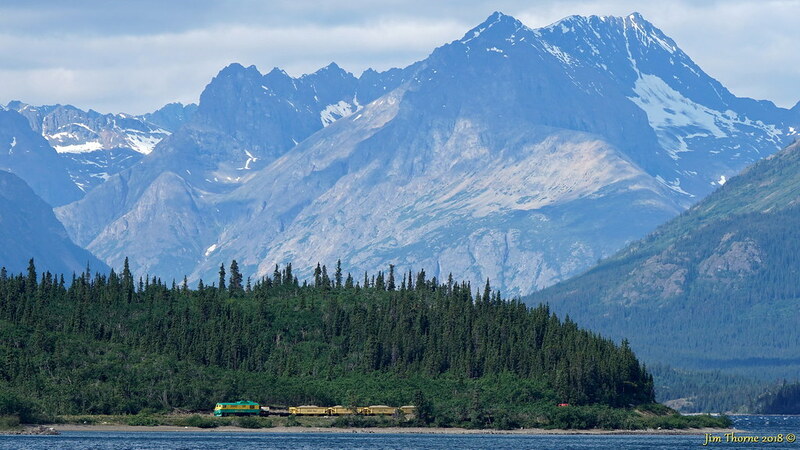 I wish I had taken many more photos of the seasons progressing, but I never imagined that that summer would be my last in Alaska. Yes, I had fairly nice weather on the two days that I was there. 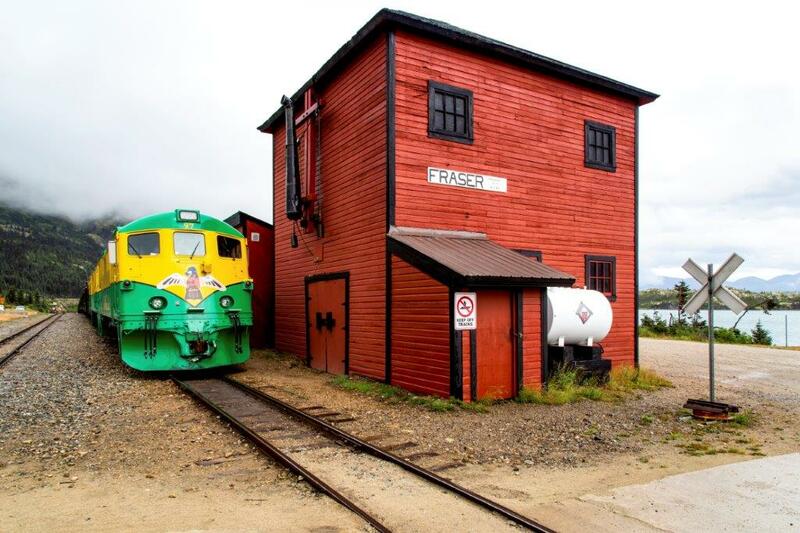 I did not actually ride the train; I just took photos in both Fraser & Carcross. 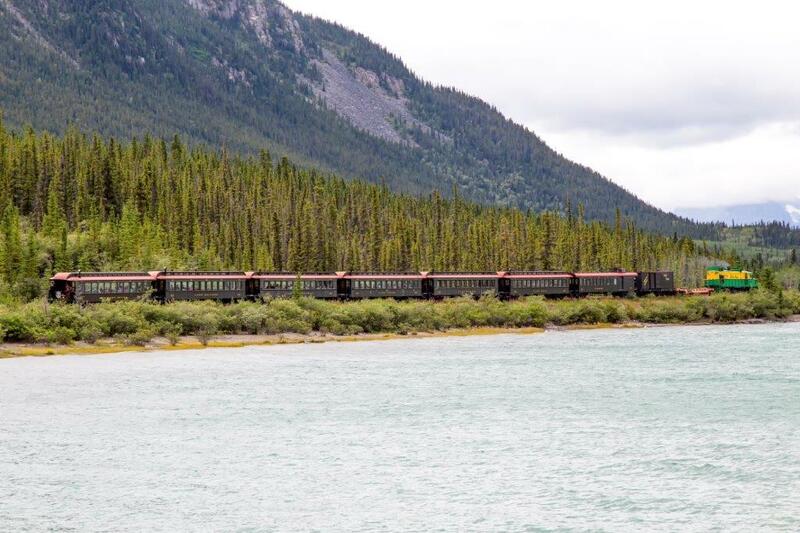 I have ridden the WP&YR train from Skagway to Carcross, but back in 2013. 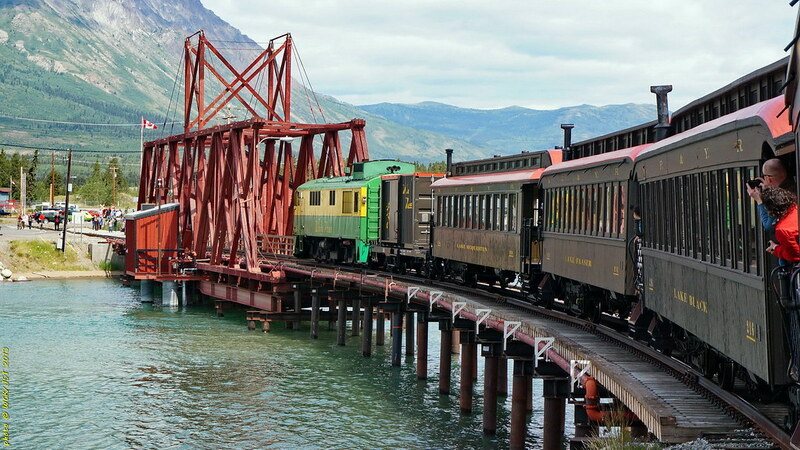 It is a trip that I recommend to everyone, to do at least once. How did you get up there? 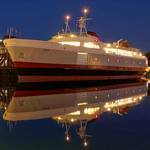 ferry or drive? I am curious. I didn't notice much road traffic except tour buses and the odd truck.